Honestly speaking, there’s not much about Farah that makes any sense to me. A purposeless being with half-dyed hair and tomato-red pout, lazing around a light-deprived house, DESPERATE for a glimpse of her piya- well, that’s Biwi No.2 for you! And now that her sautan is in hospital and she happens to be completely farigh, she decides to dedicate some of her time to the hospital because sautan ki ayadat aur piya ka deedar at the same time- this isn’t getting any better! She is trying very hard to prove that she is her sautan’s well-wisher but the bottom-line is that she married Hassan while she was aware of his first marriage so for me, she is a home-wrecker and even though she is acting all goody-goody and concerned for Aisha, I feel kay ab sautan say pyar jatanay ka koi point nahe because it’s all too late and my impression of her is not changing just like that. I find Farah’s dialogues exceptionally lame, ‘Mujhay aap say koi shikayat nahe hai, Hassan’ (why the constant pained expressions, then?) and after the news of Aisha’s consciousness, ‘Shukar hai-Hassan ab sakoon say sou tou sakain gay’- this had me in bits! Seriously, get a life! There are bigger problems than your piya’s beauty sleep. Farah and Hassan- this lethal duo is gutsy to say the least! I mean, there you have your Biwi No.1 in bed and right in front of her, you are talking to your Biwi No.2 about ghar ka kharcha and whatnot, and I was amazed to see how casually Farah introduced Hassan to her friend in the hospital, without taking into consideration that Aisha’s bhai may be within earshot. Well, with this audacity and carelessness, it’s not much of a surprise that the cat is out of the bag. Okay so Aisha’s brother, Ahmed is now aware of Hassan’s second marriage. Is it just me or Hassan deserved a slap fair and square when he actually looked Ahmed in the eye and smugly declared that Farah is his wife! This guy still has the guts to make eye contact and well, there I was, thinking there is a limit to besharmi. c) Her sautan is expecting!! I really think development a) could’ve been dropped but I’m sure the writer has something horrible in mind. You know, when Farah suggested, ‘Aap bacha adopt karlega’, the way Hassan replied, ‘Shayad kar bhi lain’ gave me a bad feeling about the future installments-in the attempt to prove that Farah is the biggest bechari and qurbaani ka bakra you’ve ever met, I hope the writer doesn’t make Farah give up her baby to Aisha because if that happens, we’ll definitely do something about ARY digital. I know Ahmed only wants to do what is in the best of Aisha’s interests but I don’t think hiding the news will do any good to her. 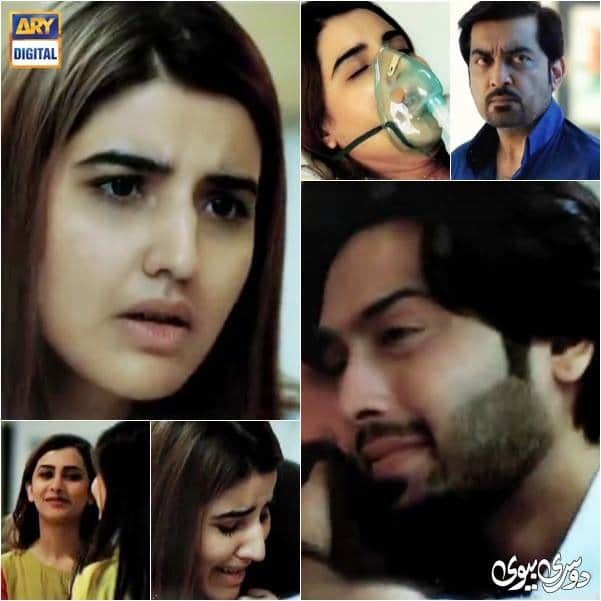 He plans to force Hassan into divorcing Farah and the promo of the next episode suggests that we are in for a lot of cheekh pukaar but honestly speaking, I want Aisha to see for herself how disloyal Hassan is because until then, the story will not progress. Share your thoughts on this episode.